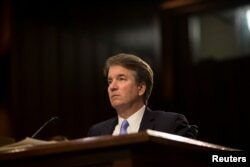 The Republican-led Senate Judiciary Committee on Thursday set a vote for next week on President Donald Trump's U.S. Supreme Court pick while a Democratic senator sent unspecified new information about nominee Brett Kavanaugh to the FBI. Senator Dianne Feinstein, the committee's top Democrat, said she received the information about Kavanaugh from a person she declined to identify. In a statement, Feinstein did not specify the nature of the information. The New York Times, citing two people familiar with the matter, reported that the information related to "possible sexual misconduct" involving Kavanaugh and a woman when they both were in high school. Feinstein said the person who provided the information "strongly requested confidentiality, declined to come forward or press the matter further, and I have honored that decision. I have, however, referred the matter to federal investigative authorities." Supreme Court nominee Brett Kavanaugh faces photographers as he prepares to testify during the third day of his confirmation hearing before the Senate Judiciary Committee on Capitol Hill in Washington, Sept. 6, 2018. White House spokeswoman Kerri Kupec said Kavanaugh has repeatedly been vetted by the FBI. "Not until the eve of his confirmation has Senator Feinstein or anyone raised the specter of new 'information' about him," Kupec added. An FBI spokesman confirmed the agency has received the information. "Upon receipt of the information on the night of Sept.12, we included it as part of Judge Kavanaugh's background file, as per the standard process," the spokesman said. "This has all the indicators of an 11th hour character assassination and a desperate attempt to delay and defeat the nomination of Judge Kavanaugh," said Carrie Severino, chief counsel of the Judicial Crisis Network, a conservative activist group that supports Trump's judicial picks. Democrats have fought Kavanaugh's nomination and sought to delay his confirmation. In party-line votes, the Republican-led committee on Thursday rejected motions by Democratic senators seeking access to more documents relating to Kavanaugh's service in the White House under Republican President George W. Bush more than a decade ago. "I don't understand the rush to judgment. I really do not," Feinstein said. Democrats have said they want to learn more about whether Kavanaugh played a significant role in controversial policy debates in the Bush White House, including those relating to the treatment of detainees held after the Sept. 11, 2001, attacks. Kavanaugh worked in the White House from 2001 to 2006. Trump's fellow Republicans control the Senate by a narrow margin. With no sign yet of any Republicans planning to vote against Kavanaugh, he seems poised to win confirmation despite Democratic opposition. Republican Senator Lisa Murkowski, targeted by Democrats as a possible swing vote, came under new pressure from a group in her home state of Alaska to oppose Kavanaugh. The Alaska Federation of Natives, the state's largest indigenous organization, issued a statement condemning Kavanaugh's positions on indigenous rights.